And as we move further and further into adulthood...and even on into old age, there's more to frighten us and cause us to panic*. How do we handle these terrors of life -- whether they be greater (like death, disease, crises with loved ones,...) or lesser (like speaking in front of a group, doing something totally new, daily mothering,...)? Last week we looked talked about faith as responding to the Lord's gracious COME. Jesus' zealous disciple Peter gives us a good example of what we present-day disciples go through in our faith-walk. Look again at this familiar story in your Bible or click here: Matthew 14: 22 - 33. *WHO HE IS: Peter needed to know that it was really the Lord. When Jesus identified Himself, He said, "It is I." Literally this is, "I AM," ego eimi. Does this sound familiar...how about Moses and the burning bush in Exodus 3? How about Jesus' confrontation with the Pharisees in John 8? We too need to see Him for who He truly is...the GOD-Man, who walks with us on the chaos of our lives, don't we? It can make all the difference in the world! *WHAT HE WANTS: Perhaps Peter also wanted to know if it was Jesus' will for him to walk to Him. And isn't that true of us too. 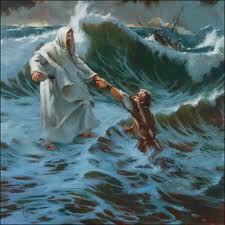 We need to know that it's really the LORD calling us out "onto the waves"...that He's "in it" for us! Truth #1 = God is always prevenient. So the God-Man Jesus also invites us to walk with Him...into new things (open doors, if you will), like the way my the Lord gave me my ESL teaching job 8 years ago. Or it may be through dark, terrorizing things, like my then 20 year old son's cancer. Truth #2 = With His invitation comes His enablement. Of course, Peter began to sink. Why? Because he turned his focus to the tumultuous waves and wind all around him. He had taken his eyes off of the stable, all-powerful Lord in front of him. And isn't that what we do also? We may start out well, fixing our eyes on Jesus. But then, when we realize "all hell is breaking loose" in &/or around us, we get our eyes off of HIM...and we begin to go down! Truth #3 = We become like what / who we focus on. Then all-too-human (and that's why we love him!) Peter, in his desperation, did what we all must do...he cried out to His Savior! You wonder what to do when you feel attacked on all sides by seemingly irresistible forces, waves that cover you and want to sweep you off your feet. sometimes these waves consist of feeling rejected, feeling forgotten, feeling misunderstood. sometimes they consist of self-pity and self-rejection. These waves make you feel like a powerless child abandoned by your parents. What are you to do? Make the conscious choice to move the attention of your anxious heart away from the waves and direct it to the One who walks on them and says, "It's me. Don't be afraid!" (Matthew 14:27; Mark 6:50; John 6:20). Keep turning your eyes to him and go on trusting that he will bring peace to your heart. That Jesus is the SON of GOD! That He is all powerful...that He is sovereign over the forces of nature...that He cares...that He challenges...that He responds to our cries...that He walks with us on the chaos of our lives! Truth #4 = Every storm of life is Christ’s invitation to come to Him and see Who He is & how all-sufficient He is in every situation. 2. What is your focus as you go through your day? Do your emotions follow along the same line as your focus? Do you believe it’s true that “we become like what we focus on”? Pray about your need in this area. *Click to read about how the Lord delivered me from panic attacks. Coming Soon: After Father's Day...the rest of the story: The Mystery of PRAYER...Inviting Jesus into my "Boat"